This PosSizer extends the capabilities of the standard position sizing methods, adding some requested options. As with most other PosSizers, define the basic position size as either fixed dollar, percent of equity, or maximum risk percent, and then see the effect of various applied rules. Be able to take only Long or only Short trades - without touching the Strategy code! Cap maximum entries per day. For intraday trades, it sums up positions taken during the day. Pick up the custom, flexible percent equity or max % risk directly from Strategy (see below). Finally, exclusively for the Max % Risk it's possible to cap the resulting position size at a specified fraction of equity to avoid skipped signals and increased risk due to a high resulting sizes. Note: the position size can't exceed 100%. The "Skipped trade solution" is somewhat similar to the so called "Position Leeway" option in discontinued Wealth-Lab 4 that allowed to include trades if there is insufficient capital. When using 100% of equity sizing, skipped trades due to insufficient capital can be caused by the gap between the basis price and the actual price. For the whys and wherefores of basis price, see the User Guide > Strategy Window > Backtesting Strategies > 100% of Equity Sizing. Note: trades may still be skipped at 100%; to avoid this, reduce the desired percent equity according to your estimated commission + slippage as a percentage of size (e.g. 100% sizing - 0.05% slippage - 0.05% commission, so final size = 99.9%). 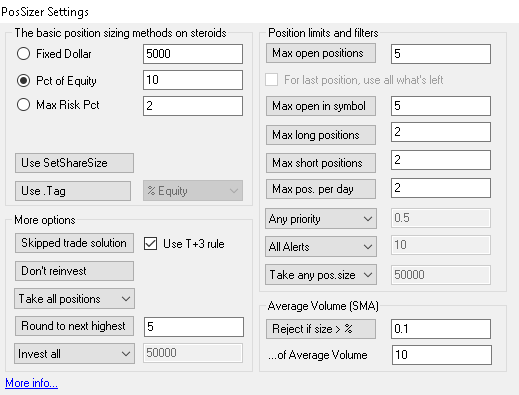 Related option For last position, use all what's left which can be engaged after pressing the "Max Open Positions" button, allows to eliminate more skipped trades in cash-limited situations. It does so by investing all available cash for trade [N+1] when you already have [N] open positions. For example: you are sizing positions at 10% equity, you have 9 open positions, there is not enough equity to take the 10th signal - this option takes the final signal, sizing the Alert using all the cash left. Or, if your Strategy employs .Tag for its own purposes, as the parameter of the SetShareSize method. For this to work, together with Use .Tag you should click on the Use SetShareSize button on the left. "Max Positions Per Symbol" works for backtests and is not compatible with Alerts. Due to a live bug in WL6, "Max Open Positions" currently does not consider Alerts and works for backtests only. "Use SetShareSize" does not work for Alerts (by design). "Use Tag" does not work for Alerts (by design). "Use T+3" only applies to cash accounts, so users should use 1:1 margin for this option.